ED Miliband was ridiculed earlier this week when he spoke about an “unholy alliance” between the Tories and the SNP to keep David Cameron in Downing Street. Of course, there is no chance of a post-election pact between the Nationalists and the Conservatives. Nicola Sturgeon and Alex Salmond have both stated bluntly, over and over again, that if the SNP held the balance of power after May 7 they would do nothing to help the Tories into office. And Labour’s eagerness to remind everyone of the SNP’s alleged treachery in helping to bring down the Labour government in 1979, paving the way for Margaret Thatcher to become prime minister, serves only to underline how impossible it would be now for the party to behave in a way that could be portrayed as a similar betrayal. If there is a hung parliament and the SNP does find itself in a crucial “kingmaker” role, the only question is whether it could negotiate a deal to help sustain a minority Labour government and how far any such deal would go. Alex Salmond took up the theme again at the weekend, emphasising the SNP’s opposition to renewal of Trident and the policy of austerity, not forgetting the demand for The Vow on “home rule” to be kept. Unhappily for Labour, it seems the idea of the SNP being able to call the shots on a Labour government is quite attractive to Scots voters. Such a scenario would mean Scotland avoided the threat of another Tory-led government, but also had the prospect of getting something more than having to settle for a Labour government which seemed not to be putting enough distance between itself and the Tories. But there is a remarkable similarity between the SNP’s message about its potential to wield significant power and the one which the Conservatives are pushing in this election campaign. The latest Tory ad has a cartoon puppet of Mr Miliband dancing to a tune played by a cartoon puppet master Mr Salmond. It follows the party’s poster of Mr Miliband tucked into the former First Minister’s breast pocket. It’s all designed to suggest that a Labour government could be held to ransom by the SNP. And while opinion polls show many Scots quite like that idea, the Tories are confident it is a very scary thought for voters south of the Border. 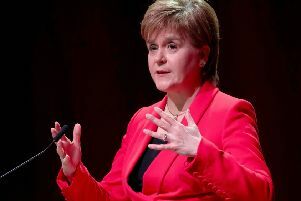 Leave aside for now the argument that the SNP’s influence might not be quite as great as it likes to suggest – a minority Labour government could in the end simply put forward its proposals and challenge the SNP to vote them down, with the risk of being accused of siding with the Tories. The fact is that, for different reasons, both the Nationalists and the Conservatives want to persuade voters there is a real prospect of the SNP being in the driving seat if Labour get the keys to Downing Street. The Tories seek to play on resentment that Scotland would get more favourable treatment at the expense of the rest of the UK and fears that the future of the UK itself could be at risk. The SNP wants to convince Scottish voters that Labour would not be able to ignore Scotland and could be made to transfer more powers to Holyrood. But beyond their common interest in establishing a picture of Labour beholden to the SNP, there is also this: the SNP would arguably find itself in an even stronger position if the Tories won, not because of any influence it could wield but because a Conservative government would be the best boost to the Nationalists’ argument for independence.